My Spring Forward Smoothie will spring you into a state of frosty, dreamy, sunny day bliss. Bright peaches, sweet strawberries, silky soy and creamy frozen bananas give this smoothie it's own healthy glow. Spring is coming. I promise it is. This weekend is daylight savings time. Then St.Patty's Day. Then voila! .. spring. I can't wait to sprawl on my back on a soft field of grass and stare up at a blue canvas sky speckled with white puffy clouds. Sweet song birds tweeting from the nearby trees. Sunglasses on. Shoes off. And at my fingertips, this pink frosty sip..
Secret Ingredient: Frozen Bananas. I don't really know why stores don't sell frozen bananas. I spot them once in a while, but very rarely and they are usually in a berry/banana mix. I mean really, frozen bananas are such a genius ingredient to add to smoothies. They are like natures dairy-free ice cream. 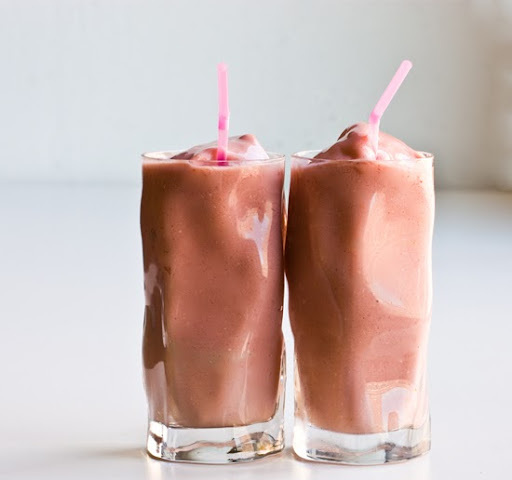 When blended they add body, texture and supreme sweet-creaminess to a smoothie or shake recipe. ..so I always freeze my own bananas. Organic. Really ripe. I slice them thin and toss them in freezer bags to grab whenever I please. My other fave frozen banana shake recipe: Banana/Almond Butter. And grab my smoothie Apps for iPhone or Droid (I'll be updating later this year with plenty more recipes to add.